It took nearly 18 years but in the end forensic science was smarter than Vicky Hamilton's killer, Peter Tobin. He left a string of clues - but for 16 years police were looking in the wrong place. The investigation into the 15-year-old's disappearance was Scotland's biggest missing person inquiry. Officers took 3,076 statements and spoke to 6,536 people, but Tobin was not one of them. It wasn't until 2006 that police realised he had been living at 11 Robertson Avenue, Bathgate, when Vicky went missing. The semi-detached house on a quiet street looking out over woodland is just over a mile from where Vicky was last seen on 10 February, 1991. That Sunday evening there was snow on the ground as Vicky left Livingston, where she had spent the weekend with her older sister Sharon. At 5pm the sisters hugged at the bus stop and said goodbye. Sharon said later that everything appeared to be normal: "She was quite happy. She was excited about coming up to my house the following weekend and that's what she talked about at the bus stop. "She was looking forward to that." To get home to Redding, Falkirk, Vicky had to change buses in Bathgate. She bought a bag of chips in the town and walked out into the cold. Several witnesses saw her asking for directions to the bus. Det Ch Insp Keith Anderson of Lothian and Borders Police, who led the eventual murder inquiry, said Vicky was "very unsure of where she was" and may have gone willingly with her killer. He said: "It may be that she's approached Peter Tobin and trusted him. "It would appear very obvious that he has taken her back to 11 Robertson Avenue. "I believe that she has been subjected to quite a violent attack within the house and that she has lost her life there." For 11 days there was no news of Vicky and then came an apparent breakthrough. A chef on his way to work in the centre of Edinburgh found her purse lying in a gutter. The purse was dry and its contents were intact. It's thought Tobin had dumped the purse between the city's main railway and bus stations to fool the police into thinking that Vicky had run away. It was a trick that tormented her family but would eventually help put him behind bars. For now though, Tobin slipped quietly away, swapping council houses with a couple at 50 Irvine Drive, Margate, on the Kent coast, nearly 500 miles from Bathgate. David Martin, who still lives next door at number 52, said his new neighbour appeared ordinary. He explained: "The first thing you realise about Peter Tobin is how normal he is. He's not something that crawls out of the woodwork even if that's what appears at a later stage. No, he's absolutely normal - like talking to your best mate or someone down the pub." Mr Martin said Tobin liked motorbikes and had custody of his young son Daniel at weekends. But he now believes he may have seen Tobin digging Vicky's grave. Mr Martin said: "I looked over the fence one day and saw him digging this massive hole in the garden and I said what are you doing Pete? You going for Australia? And he said 'no', he said, 'I'm digging a sandpit for the lad when he comes up, somewhere for him to play'. And then about two days went by and it was all filled in and flattened off." Tobin had brought Hamilton's dismembered body with him from West Lothian and buried her in the back garden of his new home. When Tobin's name was eventually linked to the inquiry in 2006, Det Ch Insp Anderson said the latest forensic science came into play. He said: "The main thing that we had which belonged to Vicky was her purse. 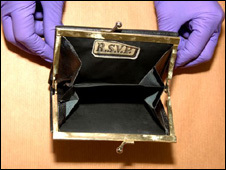 That purse was subjected to DNA examination and we were able to identify the DNA as belonging to the son of Peter Tobin. From there we went to 11 Robertson Avenue where we carried out a deep forensic search." The purse Tobin had used as a decoy had helped to trap him. In fact the DNA match was so good that it was suggested in court that he may have given the purse to his son Daniel to play with. The search at 11 Robertson Avenue then turned up another vital clue. 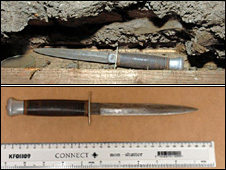 In the loft police found a dagger with a five inch long blade - and on that blade a piece of skin which DNA analysis showed belonged to Vicky. Tobin was detained by police and questioned for four hours by Det Sgt Alan Goar and Det Con David Crookston. Det Sgt Goar asked him: "How did the skin get on the knife and how did the knife get up in the loft?" Tobin replied: "I haven't got a clue but it was my knife that was in the loft. End of story." The detectives also confronted Tobin with the purse. "Do you have any explanation for that at this moment?" Tobin was asked. Police then began a search of 50 Irvine Drive, Margate. Little by little, they excavated the back garden where the "sandpit" had been. Forensic archaeologist Lucy Sibun explained what they found: "There was a thin layer of cement that had been sort of poured over the edges of and around the grave itself and then further down when we started removing the soil we found black plastic bags like bin liners. "It was evident that the body wasn't complete, it had been dismembered. That's obviously more disturbing." The body was that of Vicky, who was partially clothed and wrapped in several layers of plastic bags and cloth. Her mother's rings were still on her fingers. Jeanette Hamilton died without knowing what had happened to her daughter. The rest of her family were told of the find. It was, said Det Ch Insp Anderson, a "stunning" moment. And the chalky soil was to reveal another clue. On one of the bin bags wrapped around the body were four fingerprints. They belonged to the killer - Peter Britton Tobin. 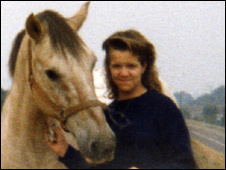 Exactly how he murdered Vicky is not known, but a post-mortem examination revealed the presence of amitriptyline in her body, an anti-depressant with sedative side effects which Tobin had been prescribed before the murder. Intimate swabs from the body, which appeared to contain Tobin's DNA, also suggested a serious sexual assault. And then there were the purse and the dagger. The evidence led police to conclude that Tobin had drugged and sexually assaulted Vicky and then killed her, possibly by strangulation, before using the knife to cut her body in two. Tobin's trial at the High Court in Dundee lasted just over four weeks, with 122 witnesses giving evidence in the imposing Victorian courtroom with its tall windows and Wedgwood blue ceiling. But the overwhelming forensic evidence helped the jury to convict him. 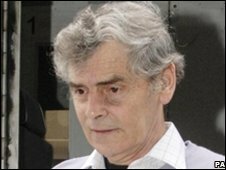 At 62 and in poor health, Peter Britton Tobin is likely to spend the rest of his life in prison.